The 5th wheel and gooseneck hitch are excellent methods to tow heavy campers or trailers with your truck. If you want to remain on the trailer while it’s being towed, you should definitely go for the 5th wheel one. But what if you don’t know anything about the 5th wheel hitch installation? Well don’t worry, you can learn how to that right here right now. Check out this article and you can finish installing the hitch quickly and effortlessly. Generally, to equip a truck with a 5th wheel hitch, you need to put in the rails first and then the hitch. 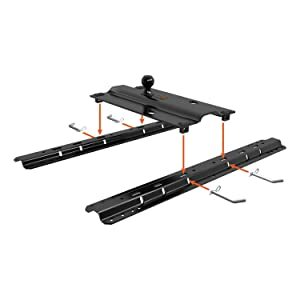 For most of the time, a 5th wheel hitch kit will also provide an associated set of rails for you to use. And to ensure a safe and efficient operation, a lot of measurement will be needed. If everything goes smoothly, the hitch installation will be completed after a few hours. More details about the process can found right below. Follow them closely and you will have no trouble. Before you attempt to install the hitch, you have to make sure that your truck can handle the weight of the trailer. Both 5th wheel and gooseneck hitch are suitable for heavy loads. Yet it means nothing if your truck doesn’t have a sufficient towing capacity. Look for the GTW (Gross Trailer Weight) in the manual to see if your vehicle can handle it. This is a really important point but many tend to overlook it. In the case that you can’t seem to find it, get the manufacturer on the line for a reliable answer. There are 5th wheel hitch kits that are designed for specific types of vehicle. If you manage to purchase the one that is suitable for your own truck, there may be no need for any drilling. The holes in the rails should align themselves perfectly with pre-existing holes on the truck bed. This makes it easier to bolt in the rails and speed up the hitch installation. You can always get a universal kit if you want to though. But you probably have to alter the truck appearance to properly accommodate the rails. Finally, there is the issue of the truck bed liner. If your truck bed utilize plastic liner, it’s not suitable for the rail. You may feel that the plastic look secure at first but later vibration will loosen it. As result, the hitch rails won’t be secured and the entire thing may fall apart. However, if your vehicle got a spray – in bed liner, you can install a 5th wheel hitch with no issue. And if your truck doesn’t have bed liners, feel free to put on the hitch rails without any worry. In order to have a safe operation, the hitch must be located at an appropriate position. The gap between the planned hitch rail positions and the cab must be at least 56 In for a long bed truck. In a short bed one, this measurement should be around 36 In. It’s ideal for the hitch to be as close as possible to the center of the truck bed. After you are done with the measuring, mark down the spot that you think to be the best one. That is one of two steps to figure out where to install the rails for the hitch. In the next step, start from the tailgate, the distance to the hitch should be 28. 3125 In for a long bed truck. The measurement will be 26.3125 In if your truck is a short bed one. Mark down this spot as well and you will have a general image of the hitch rail location. Do it right and you will have a smooth experience with the hitch. Depend on your choice of the kit, you may or may not have to drill the holes. If you got a universal kit, proceed to drill 2 holes for each of the rail based on previous markings. In either case, you have to place the rails holes upon the bed holes and bolt down the rails. Use suitable tools to achieve maximum efficiency. After that, place the hitch upon the rails and bolt it down as well. When your truck is a short bed type or just don’t have spaces to maneuver with the hitch, an extension will be needed. This will be attached to the kingpin which shall offer an extra gap of 20 In from the truck pin to the trailer pin box. Normally, it will be locked in place but when a need arises, the back portion of the extension can be unlocked. That should offer enough space for the truck to turn with the 5th wheel hitch on. While the 5th wheel hitch is really useful, what if you have to tow trailers that only accept a gooseneck hitch? It will be troublesome to actually change from the 5th wheel hitch to a gooseneck one just to tow a trailer right. That is why an adapter will be a nice addition along with the hitch itself. With this device, now you can conveniently tow both types of trailer hitch with little preparation. If you don’t know what to get, the CURT 16055 Bent Plate 5th Wheel Rail Gooseneck Hitch Adapter will serve you well. It’s easy to use and install which can support a lot of weight. Just bol it in the 5th wheel hitch rails and you can start towing gooseneck hitch trailers. It’s very durable and can endure harsh weather conditions. And that is almost all you need to know about 5th wheel hitch installation processes. Pretty simple and straightforward, right? A 5th wheel hitch will be a useful addition to your truck that allows a smooth towing of trailers. All you have to do is to follow the step above for an efficient installation. As long as you can ensure that, the 5th wheel hitch will prove to be a wise investment.